A leading manufacturer of popular kitchenware brands was seeking to better diversify their referral traffic and increase overall traffic to their eCommerce website. To fulfill this initiative Metrics was enlisted to develop a customized Search Engine Optimization (SEO) program for their site. In this webinar, learn how our custom program helped improve search engine rankings and increased traffic utilizing code and content optimization, link building and structural recommendations. A customer journey map can be the keystone to improving and analyzing any customer experience or channel. It will create a visual roadmap of the experience your customers have when they engage with your company. It is an important tool that can unify your team as well as entire groups within your organization around a customer’s experience. It clearly depicts a customer’s interactions, perceptions and feelings regarding your brand as they travel through their experience. This webinar will help you understand what customer journey maps are, why they’re valuable, and Precision Dialogue’s process for creating them. In this webinar, we will review the hot topic of Attribution Analytics, and how it compares to classic Marketing Mix and Lift-Over-Control approaches to measuring marketing ROI. All 3 approaches – Attribution, Marketing Mix and Lift-Over-Control – measure marketing ROI … but how does Attribution Analytics provide a more accurate and complete picture of how omni-channel marketing (“multiple channels and contacts all mixed together”) impacts your customers and sales? We will also review different methods of doing Attribution Analytics, including last click (contact) and model-based methods. We then conclude with an overview of what you need in order to evolve your marketing ROI solutions to the next level of sophistication and performance. Did you know that there are different types of mobile design approaches for email? Join us as we review mobile aware and responsive design techniques for email. In this webinar, we will help you determine which mobile design approach best fits your needs and also show step-by-step how you can start coding your next responsive design email. Companies understand that improving customer engagement leads to more loyal and profitable relationships and more effective marketing. But many are unsure of how to make this omni-channel marketing strategy come to life. Learn more about Precision Dialogue’s proprietary methodology to help companies successfully engage their customers. Join us as we discuss the key items you should review in your email campaign before deploying to a live audience. We will share with you our email quality checklist that you can use to test your own email marketing campaigns and demonstrate how you can use Litmus rendering to test your campaigns in various email and mobile platforms. 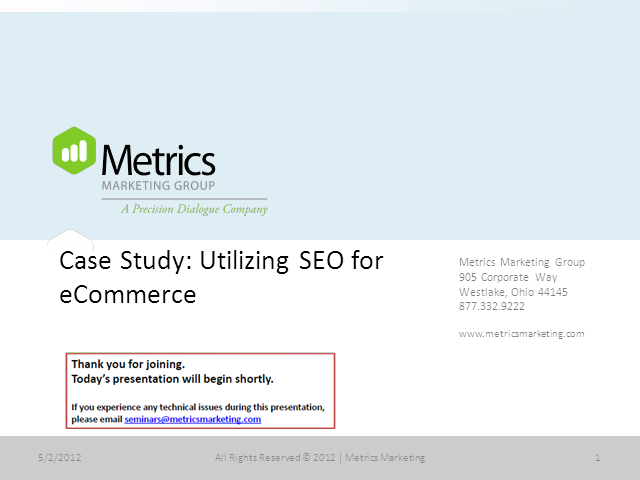 We will also discuss best practices in regards to A/B testing and performance. Hope you can join us! How do I continue to keep my subscribers interested and clicking through my emails? What should I do when subscribers stop opening and clicking, but don’t unsubscribe? If you have ever been called upon to forecast sales, revenue, demand, or other important business KPIs, it’s important to understand the different forecasting approaches available. A typical approach is spreadsheet-based judgmental forecasting where you project revenue, volume, or profits for a business. However, these top-down forecasts wind up being inaccurate because they don’t account for external economic factors, or they are driven by wishful thinking at the senior executive level. Robert Ellis, Business Alliances Team Leader and 27-year USPS veteran, will be presenting valuable insights and tips for maximizing the impact of direct mail. Learn how to cut through the media clutter to connect with target consumers and convert them into loyal customers. Using current case studies and statistics, the session demonstrates how to effectively integrate direct mail with other media campaigns to amplify your message and increase ROI. Your website may be cutting edge, but is it cutting the mustard? A site’s design, usability and functionality are important, but so is the most overlooked component - content! In this webinar, we will provide insight on how to write content that is informational and can “talk” to users. Also, how to leverage best practices to develop useful content intended for the web. 2012 was a big year for relevancy marketing, photo-sharing social platforms such as Pinterest and Instagram, mobile/tablet adaptation and more. Will these trends continue in 2013? Or, will new trends emerge? In this webinar, we share our predictions for 2013 and tips on how to align your marketing goals to meet the industry’s trajectory. Social media marketing has evolved, yesterday’s success measurement of likes and retweets has died and engagement metrics have shifted. In this webinar, we’ll look at a few recent examples of engaging social media campaigns and how they might have changed the mindset of “success.” You’ll leave this webinar with some ideas that will help you measure your social media channels and help tie ROI back to social. Monitoring your online presence can be time consuming, but with the right tools it doesn’t have to be. In this webinar, learn how to use R, a statistical programming language, and Tableau, a Business Intelligence tool, to create marketing dashboards for monitoring social media conversations and customer sentiment. Join us for a live demo showing how marketing dashboards can help you monitor your online presence. Do you know the difference between CAN-SPAM and CASL? What about blacklist vs. whitelist? Do you know the dangers of buying an email append list and why it’s important to establish a good sender reputation? In this webinar, learn the answers to these questions and the basics of email deliverability so your email marketing campaigns achieve inbox success. Our experts will cover the basics of email deliverability, provide tips on how to establish and maintain a good sender reputation, give insights on repair and reengagement strategies and more. Learn how to make a memorable impression with your email campaigns by optimizing your welcome emails. In this webinar, learn how to take full advantage of your welcome email opportunities through examples and actionable best practices. Also, learn more about leveraging the welcome email to increase ongoing engagement and sales. Both user experience (UX) and search engine optimization (SEO) are important to gain and convert website visitors, but often one or both are overlooked during a site redesign. In this presentation, learn how SEO & UX can truly complement each other, and work seamlessly together to accomplish both goals of driving traffic and converting users through your site. Is optimizing your Magento eCommerce website a goal for 2012? Metrics has developed an optimization checklist to help take your Magento site to the next level. During this webinar, our expert will discuss redesign and enhancement do's and don'ts and reveal untapped opportunities, in areas such as SEO/SEM strategy tactics, third-party solutions integration, and mobile and tablet strategies. A new year calls for a new marketing plan. Are your 2012 interactive marketing goals aligned with the industry's 2012 trajectory? In this webinar, we will specifically look at the top ten trends in interactive marketing such as eCommerce, search engine marketing, email and more. Are you interested in increasing overall customer engagement with your email campaigns and decreasing abandoned shopping carts? Metrics Marketing has created a solution by combining the power of the ExactTarget email platform with the strength of Magentoâs eCommerce solution. In this webinar, learn how to better leverage your customersâ data to increase engagement and sales. Precision Dialogue is an analytics-driven, multi-channel, Customer Engagement Firm. We leverage customer insights to drive relevant communications (a precision dialogue) leading to improved Marketing ROI.